Accept applications online, then use the embedded Evaluation Wizard to more quickly and effectively select the most promising applicants. Place Anywhere. Post automated application links on your intranet (e.g., for employees) or website (e.g., for nonprofits). Customize. Create custom-branded templates quickly and easily with user-friendly guidance. Improve decisionmaking. Create standardized, objective rating categories to promote simpler and more robust evaluations (by one or multiple evaluators). Encourage more impactful and accountable projects by guiding participants to explicitly identify – and align – their logic model's goals, objectives, strategies, and metrics. Automatic pop-up windows provide step-by-step guidance. Bulletproof Your Design. Encourage robust strategy by mapping cause-and-effect assumptions. Measure Performance. Ensure accountability by embedding input, output, and outcome metrics. Share Easily. 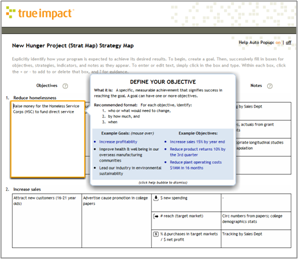 Communicate the resulting "logic model" or "theory of change" via simple, one-page summaries. Capture outcomes and impacts via integrated online stakeholder surveys. Customize. 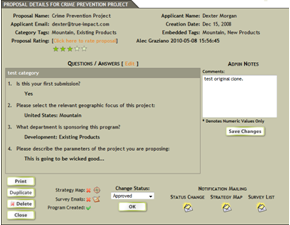 Create and customize surveys quickly and easily, and schedule them to capture short-, medium-, and/or long-term effects. Standardize. 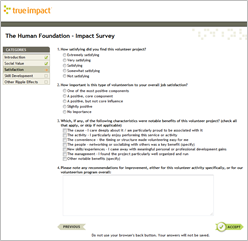 Use the question library to standardize results and support ROI data collection. Capture Holistic View. Report across programs to evaluate and benchmark your portfolio's total footprint. Use the report manager to aggregate and analyze findings. Save custom reports. Select the custom parameters you wish to report on, and save that report template for future one-click use. Filter/group on unlimited categories. Create any number of hierarchical categories (e.g., geography, department, investment area, etc.) to facilitate program management. Access all data. Export raw proposal or survey/reporting data to Excel at any time.